Sleek, glamorous and deluxe, the jewellery by Vara of London pays tribute to the founder Mayuri Vara’s travels, her time living in Britain and Hong Kong, as well as her Indian heritage. Vara, a self-taught jewellery designer, debuted her first collection at the Jewellery & Watch Fair at Saatchi Gallery in London last year. Dedicated to creating versatile and timeless jewellery for women, Vara’s brand offers a plethora of pieces which blend exotic Asian elements with plant-inspired features. Drawing inspiration from our city’s iconic heritage, The Man Mo Temple and The Bamboo Leaves Ring collections celebrates the beauty and strength of bamboo. 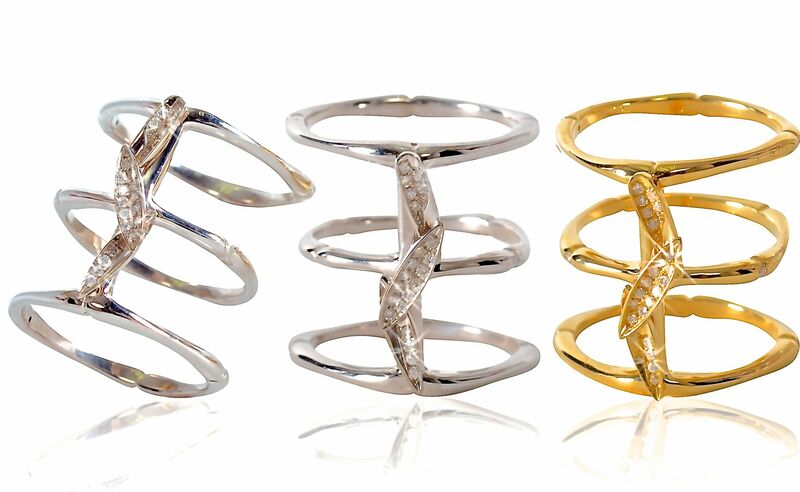 Featuring cuffs and rings set with diamonds, these minimalistic designs offer effortless elegance in style. Opulent and extravagant, the Fleur de Chine Rings are inspired by the lotus flower with a lucky Chinese coin gallery at the reverse. The Taylor Cleopatra Cuff, on the other hand, is a luxurious piece paying homage to Elizabeth Taylor, one of the founder’s aspirational icons. Whimsical and striking, the Serpentine Collection will make you stand out with the sleek blend of smoky quartz and black diamonds. Collections are available at Joyce, Pacific Place, and Landmark Mandarin Oriental at The Oriental Spa.